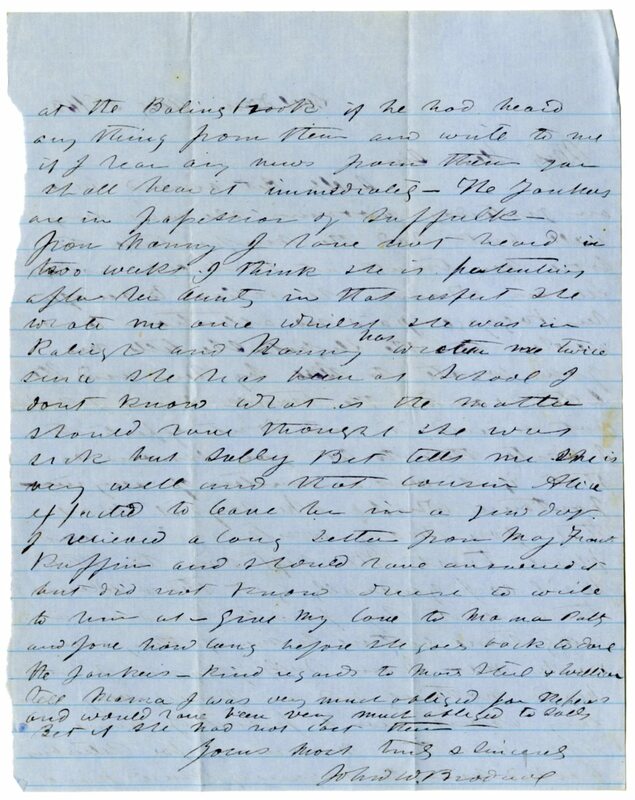 Item Description: Letter, dated 2 August 1863, from John W. Bradley [?] to a “dear sir” which largely discusses mail and mutual acquaintances. More about Ruffin Thomson: Thomson was the oldest child and only son of William H. Thomson and Hannah Lavinia Thomson. He studied at the University of Mississippi and the University of North Carolina, leaving school in 1861 to enter the Confederate Army, serving as a private until February 1864, when he was commissioned a second lieutenant in the Confederate Marine Corps. After the Civil War, he studied medicine in New Orleans and began a practice in Hinds County. In 1873, he married Fanny Potter. In 1888, he went to Fort Simcoe, Washington Territory, as clerk to the Yakima Indian Agency, hoping to recover his failing health, but instead died soon after his arrival. Sally Bet arrived here on yesterday morning and was very well but had the misfortune to loose her trunk at Raleigh as Capt Lee on whom she relied to see after her baggage paid no attention to it or her at the depot. She tells me you wrote to me by her and the letter was in the trunk hence I have not received it and wont expect to I write this to let you know so that if it was a matter of any importance which she says it was not you may write again and please trust the next one to the mail as I generally get those whereas those sent by private hand are a long time getting to me if they even reach me – from Sally Grogan I have heard nothing and am feeling very uneasy about her a friend of mine left here this morning for Petersburg I asked him to inquire of Bruce’s friend at the Baling brook if he had heard any thing from them and write to me if I hear any news from there you shall hear it immediately – The Yankees are in possession of Suffolk. from Nanny I have not heard in two weeks I think she is [?] after her aunt in that respect she wrote me once while she was in Raleigh and Nanny has written twice since she has been at school I dont know what is the matter should have thought she was sick but Sally Bet tells me she is very well and not cousin Alice expected to leave here in a few days. 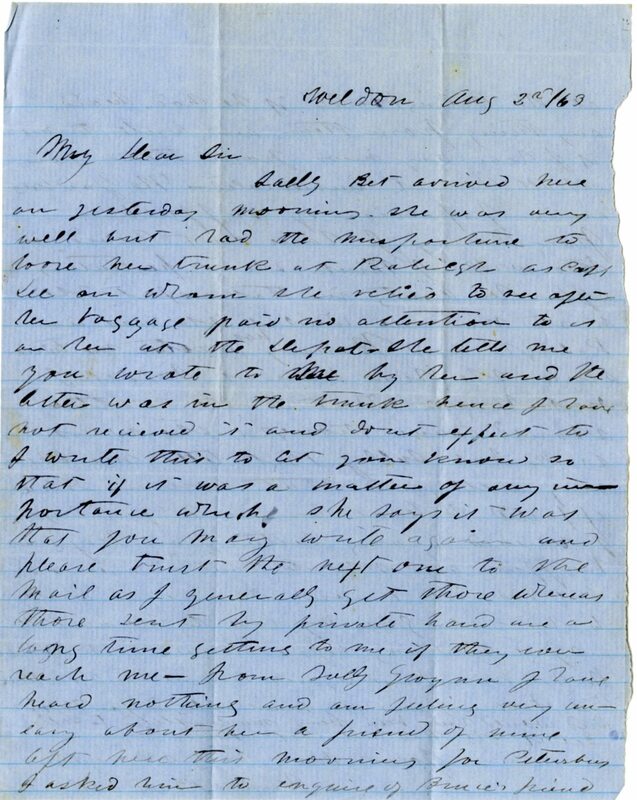 I recieved a long letter from Maj Frank Ruffin and should have answered it but did not know where to write to him at – give my love to Mama Patty and Jane how long before she goes back to dare the Yankees – kind regards to [?] Steel & William tell Mama I was much obliged for the pens and would have been very much obliged to Sally Bet if she had not lost them.